While most everyone is gearing up for holiday travel/ meal preparations, we are busy bees finishing up 2018 Calendar Girls! This year, we are making another round of 500 girls, and I am happy to report that we will have more releases (i.e. more girls available online) than usual! 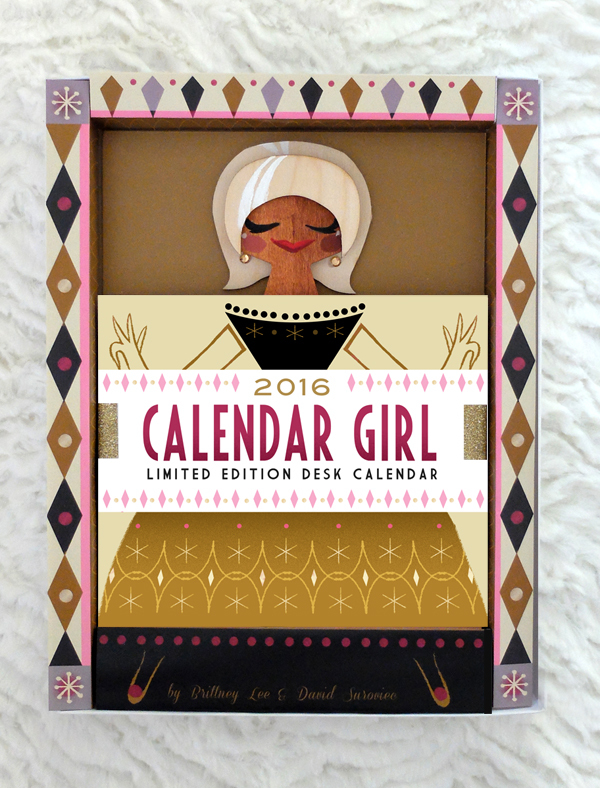 As promised, here is a lineup of days and times when 2018 Calendar Girls will become available in my shop! 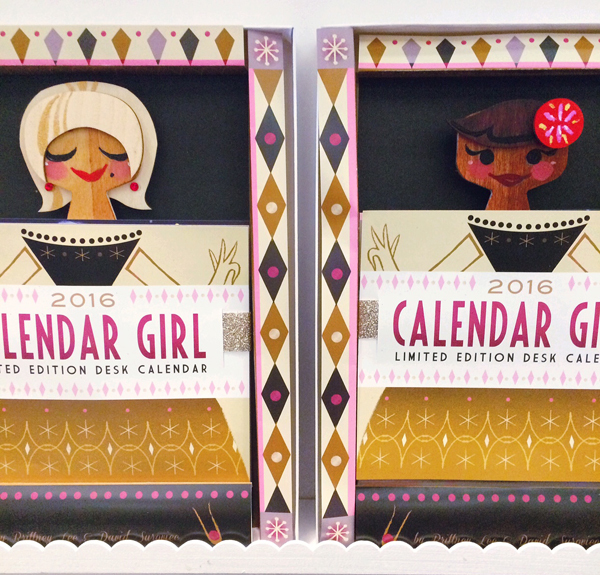 Repeating That Last Bit: Calendar stands (the girl part of the calendar) are not and will not ever be sold separately from the pages. Please do not attempt to purchase pages as a way to reserve a girl - it will not work. 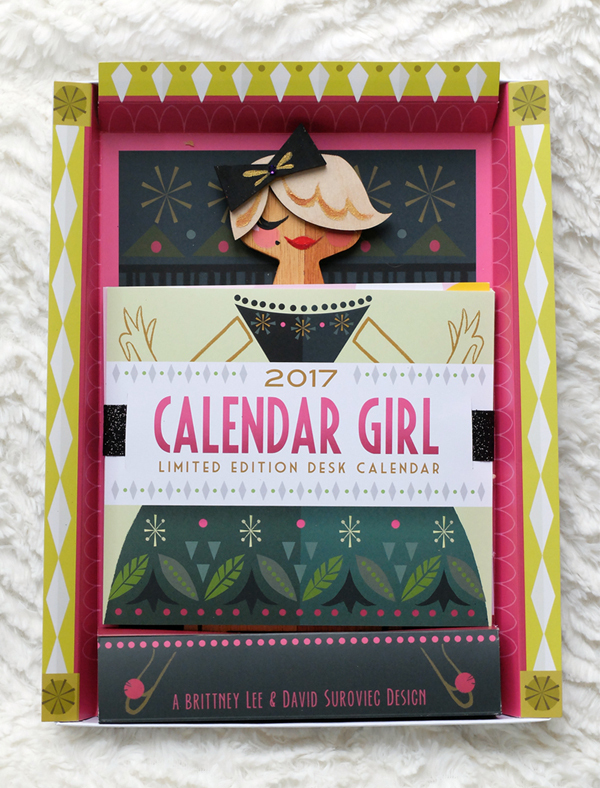 The full Calendar Girl includes the wardrobe for 2018, so if you are new to purchasing calendars, she is all you need! I wish you all a happy and healthy Thanksgiving week, and a wonderful Holiday Season to come! Much like last year, I find myself in the predicament of having some 2017 Calendars left over past the New Year - and by some I mean a lot! So! What that means to the five people who still read this is that there are a few more chances this week to snag 2017 Calendar Girls. Hooray! For those of you who may be new to this site or to buying calendars, I recommend taking a look at this post for some troubleshooting tips! The price for this new batch of calendars will be reduced to $75 each, and all girls include the full deck of 2017 calendar pages. Thanks so much for checking in on this little space! Hopefully I will be back soon with some non-calendar updates! Ta ta for now! I once again had hoped to get this post up earlier, but it seems that the holidays get more and more crazy every year! I'm headed off on a quick work trip to New York for a few days, but I wanted to make sure that I get this schedule (and a few batches of girls:) up before I go - so here it is! Check out quickly - Etsy does not hold items for you in your cart. I had many people complaining that they had calendars in their cart that were removed before they could check out. If you know that you would like to purchase a calendar, pick one and check out as quickly as possible to avoid losing out to another customer. 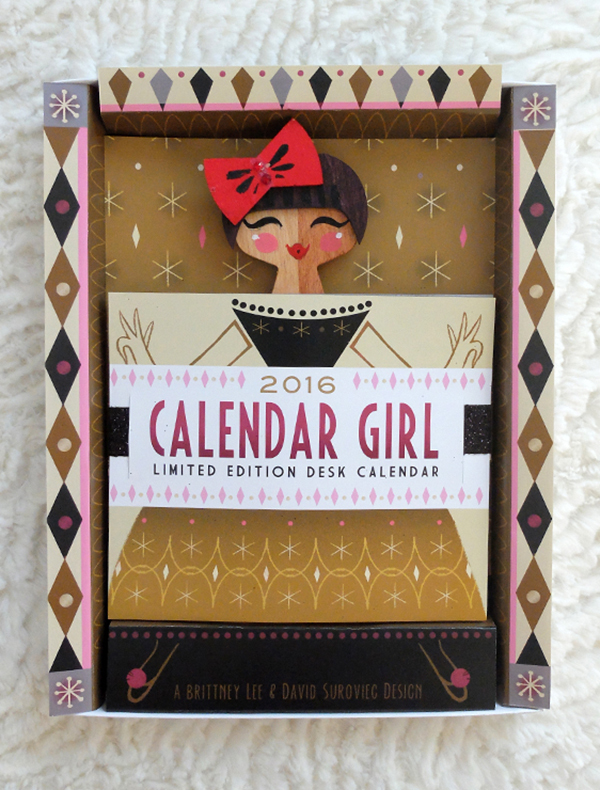 Repeating That Last Bit: Calendar stands (the girl part of the calendar) are not and will not ever be sold separately from the pages. Please do not attempt to purchase pages as a way to reserve a girl - it will not work. 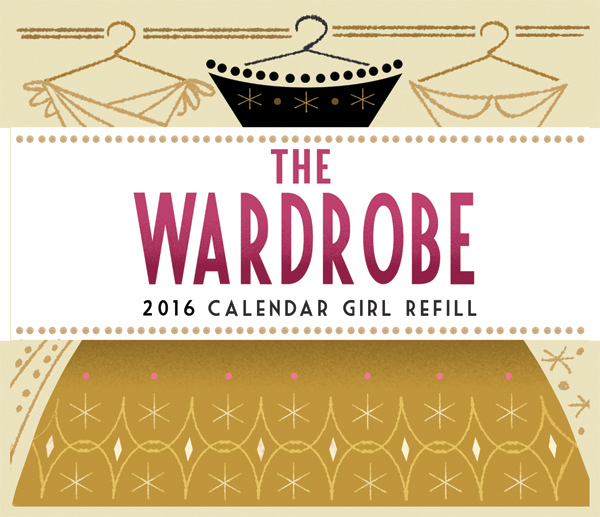 The full Calendar Girl includes the wardrobe for 2017, so if you are new to purchasing calendars, she is all you need! Whew! Again, I want to sincerely thank you all for your patience and continued support. I have been and continue to be completely overwhelmed by the response to this little project of ours. Thank you all for being such wonderful cheerleaders - I hope you all have a magical holiday season. Cheers! I love to try new things - to push past what I know (and know how to do) and to forage into unknown territory. Inevitably, in doing so, I often discover happy accidents... as well as a fair share of unforeseen problems. When I set the goal to make 500 Calendar Girls for 2016, I knew it would be a challenge. I drastically underestimated that challenge. The holidays are a busy time of year in general, but the 2015 holidays hit me like a ton of bricks being launched from trebuchets in every direction. I have tried to be a little off-the-radar for a bit because all signs were definitely pointing towards me needing to slow down and take a break for my own health and sanity. That helped tremendously, so now I think we can pick up the pace a little. So, long story short - I still have 2016 Calendar Girls! A LOT of 2016 Calendar girls. And they are finally ready to be shared with you lovely folks! For those of you who may be new to this site or to buying calendars, I recommend taking a look at this post for some troubleshooting tips! The price for this new batch of calendars will be reduced to $75 each, and all girls include the full deck of 2016 calendar pages. Thank you all so very much for your patience - here's to 2016 being the best year yet! In order to stay inspired as an artist, I find that it is best for me to constantly have multiple ideas and projects brewing. Every once in a while, though, I will have one project that I am just dying to work on. It brews and builds and eventually becomes an all consuming monster that absolutely has to get out or it will wreck me. Enter this familiar face/hairdo/dress combo. 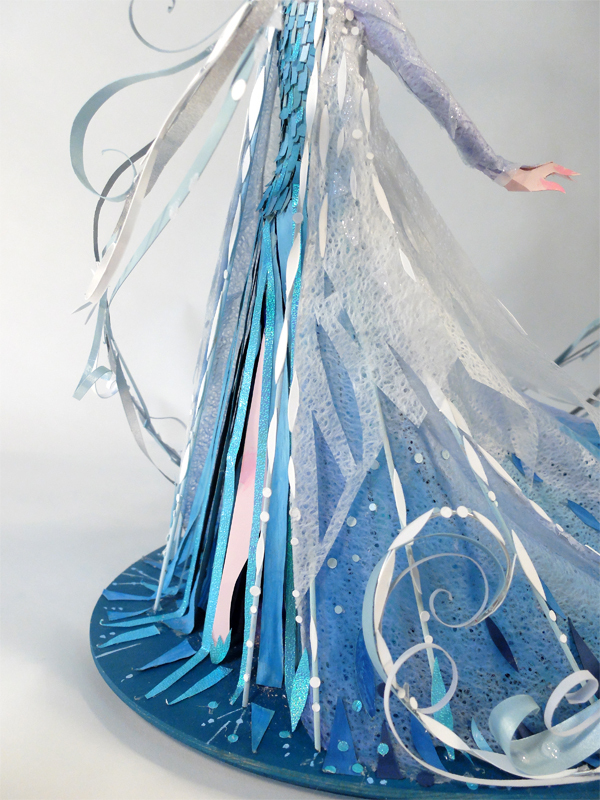 Ever since I worked on the Maleficent piece for the Sleeping Beauty Blu-Ray (which I realize I've never posted about….more on that later) I've been intrigued by creating fully sculptural paper pieces. They are so much more labor intensive and harder to plan than my usual relief fare, but part of what I find inspiring about creating any artwork is what I don't know...and subsequently learn in the process. And these pieces involve lots of learning. And failing. And learning some more. Sometimes (aka a lot of times) tears. I learned A LOT while working on this piece, and I considered starting over from scratch quite often. 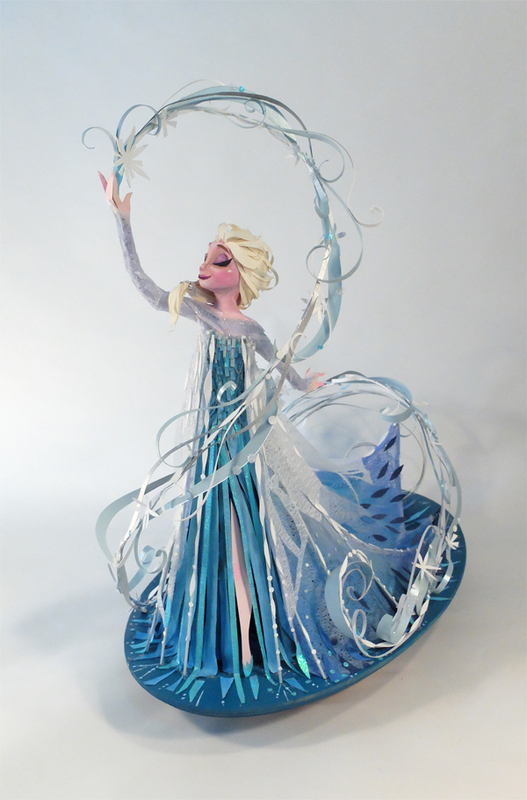 In fact, as I went to photograph her to get final approval from Disney, I very nearly scrapped her altogether. It took my much more sane, balanced husband saying "What?! What are you talking about?!" to draw me back from the edge. I suppose the closer a project is to you, the harder it is to see clearly with objective eyes. 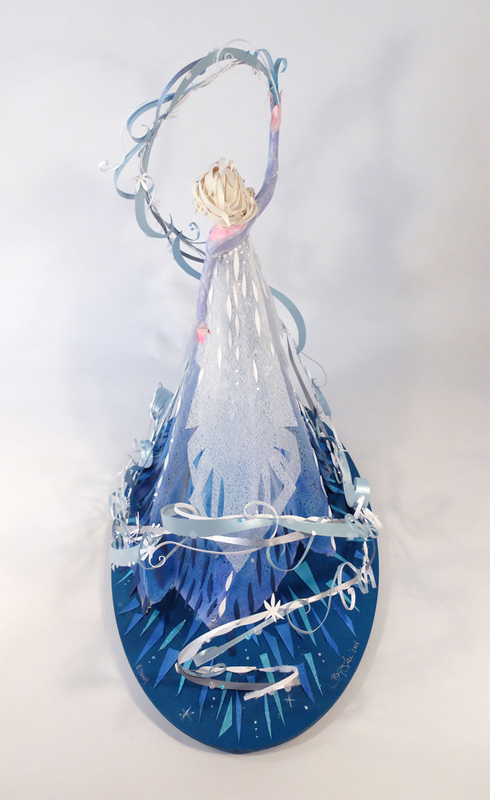 Elsa means a lot to me - I wanted to be able to do her justice. This piece is titled "One with the Wind and Sky", and it is my love note to her. 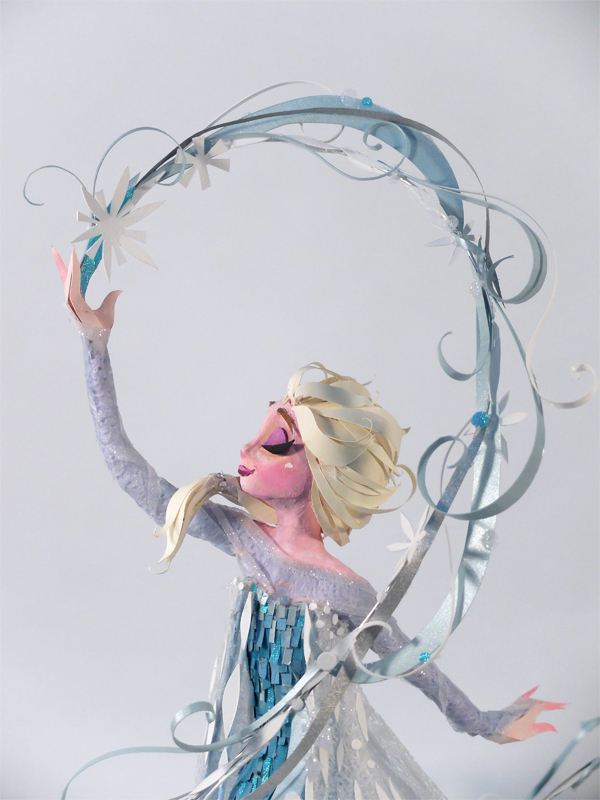 It is my love note to Frozen - to the people who let me be a part of this wonderful film and for the two years that I was allowed to help craft it. To Idina for lending her perfect voice, and for all of it for making pretty much all of my dreams come true. 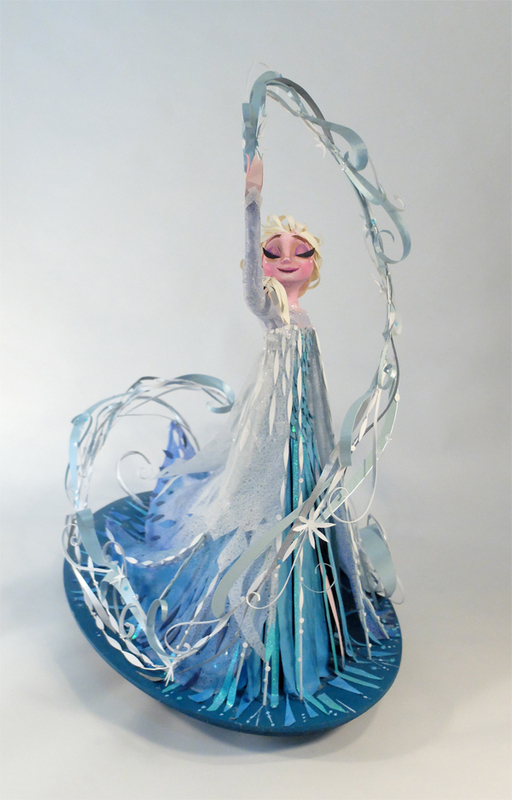 Geeze - we are in danger of having more Frozen gush sessions than mermaid posts around here. 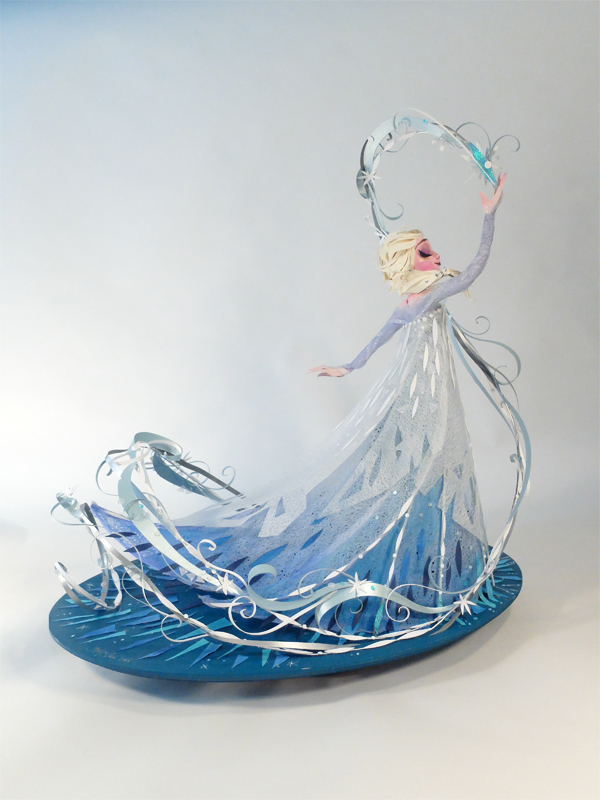 This post is several weeks late - I had initially intended on posting her the day that she would debut at the Wonderground Gallery in Downtown Disneyland, but unfortunately a stomach flu put a wrench in all of my grand-master plans. I'm on the mend, though, and thought that she would be worth posting anyway. Thank you to everyone who has already made the trip to see her in Disneyland, and for all of your kind words of support. Happy Holidays to all! But first! I had hoped to release this schedule earlier in the week, but sickness put a wrench in those plans. Sickness also halted production a bit, so I wanted to make sure that I would be able to hit this release schedule before putting it out there for all of you. So here goes! So that's it! Again, I want to sincerely thank you all for your patience and continued support. I'm so grateful to be able to create the things that make me happy and just hope that they can make others happy as well!. Have a wonderful week, and cheers to a magical Holiday Season! As I mentioned in the last post, this coming Saturday (December 5th) the Wonderground Gallery in Downtown Disneyland will be hosting all six of the Lovely girls for an artwork release and book signing! It will be the first time in a long time that Lisa, Lorelay, Helen, Vicky, Claire, and I will all be together, and we are all very excited! I was asked to create some new artwork to be released at the event, and while I had quite a few initial ideas, top priority went to this young lady. Have I mentioned that I'm a fan? No? Huh. Well, I am. It may be to the point of unhealthy obsession, but I try to channel that energy in the most productive ways possible. Thus, very large paper-cut artworks are born. This piece is titled What's a Fire?, and stands at about 36 x 16 inches, making it one of the larges pieces I have worked on in some time. I fear that I may sound like a broken record for those of you who have been around for a while, but Part of Your World was my introduction to pure magic, and remains the standard that I compare all movie moments to. I could go on and on about why it is just perfection, but the bottom line is that it makes me feel. And I love that. The original piece will make its debut on Saturday at 11am, and I believe that prints and possibly a few other items featuring the artwork will be produced through the gallery as well. I'm sure that the six of us will be taking pictures the day of, so stay tuned on instagram and twitter (and who knows, maybe even Periscope?) for real-time updates. I'm briefly coming up for air after a few months that felt like one mad-dash to several simultaneous finish lines. CTN-X is officially over and did not disappoint (thank you to all who came out and said hello and gave me so many hugs! 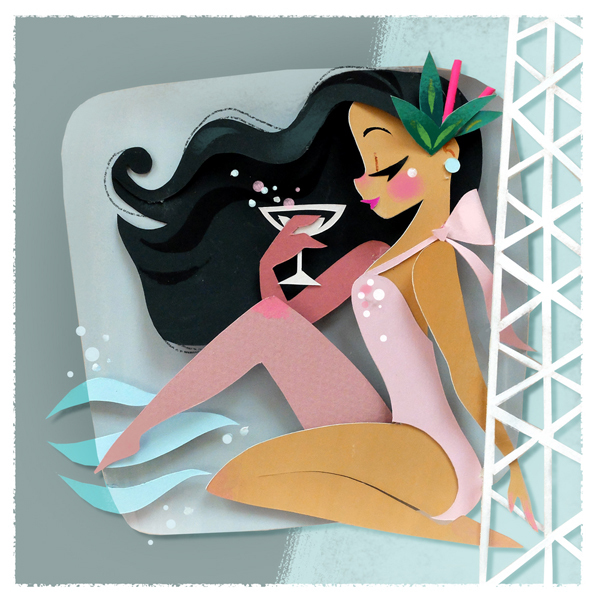 ), and next weekend all of the Lovely girls are getting together at Wonderground Gallery in Downtown Disneyland for a special artwork release and book signing! I managed to just barely finish a couple of new pieces for that event - more to come on that shortly! And then lastly but not least(ly), we have the girls. 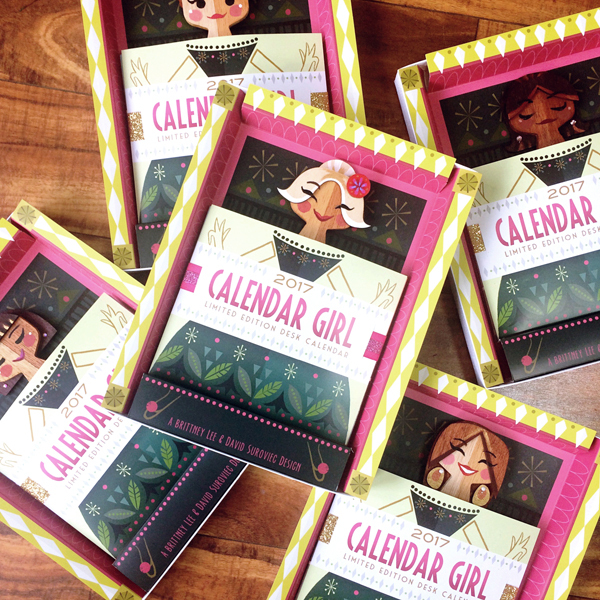 I have to be honest - I've been completely overwhelmed with the response to these calendars. I am so grateful to everyone who has given me such wonderful feedback, and so I'm really trying to make sure that everyone who wants one can get one. We upped the Calendar Girl edition number this year to 500 (which is why I need to make this post brief - gotta get back to work!) and most of them will be going online in batches through the month of December. I will post a solid release schedule sometime next week, but I wanted to let everyone know that the first batch will go up in the Etsy shop on Monday, November 30th at 10am PST. To recap for anyone who is unfamiliar, the Calendar Girls were an experimental project that David and I started two years ago, and we got such great feedback that we decided to continue with them as a yearly project. 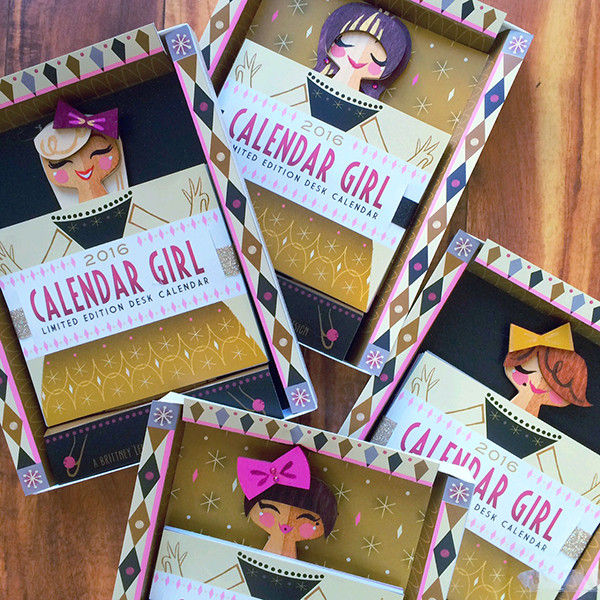 The concept is simple: A monthly desk calendar that is basically a paper doll. 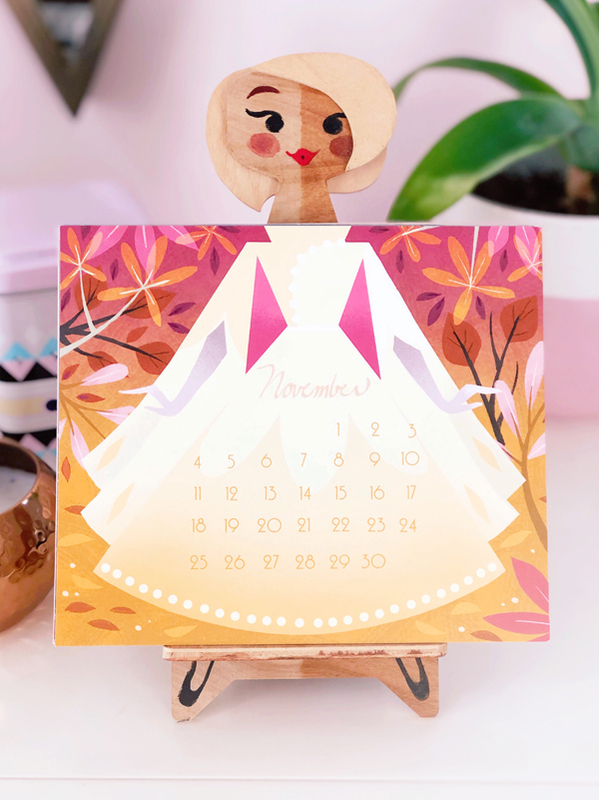 The stand is made from maple plywood in the form of a girl, and every new month is a page with a different outfit. While all of the pages are the same for each calendar, each stand/girl is hand stained, painted, and completely unique. The class of 2015 will contain 500 girls, all hand numbered, signed, and ready to go! And for those of you who managed to snag one of the last two editions of the girls, we will be selling the new 2016 Wardrobe Refill Pack in the shop! 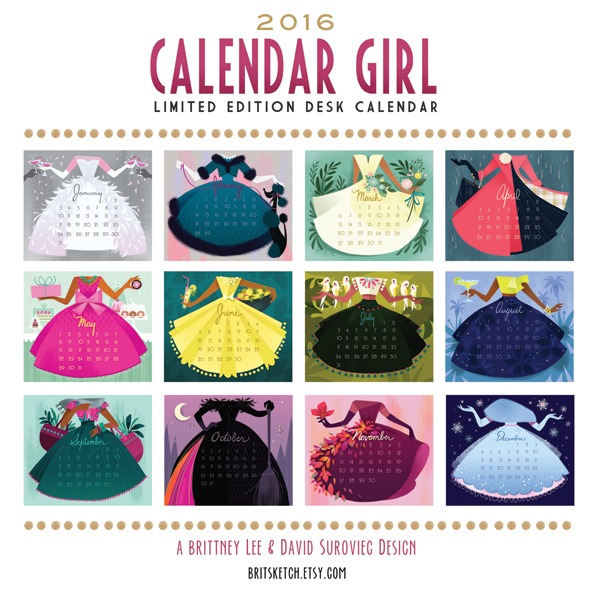 These refills are specifically for those of you who have purchased the calendars in the past - Each of the new 2016 girls come with their own set of dresses included. I will also be putting the wardrobe packs up in the shop on Monday morning. Thank you again to all of you who take the time to travel over to this space when posts are so few and far between. I could not be more grateful for the support that I receive from all of you, and as a little thanks, I'm going to be putting a sale on in the shop from now through Monday. Everything in the shop will be 10% off - just use the coupon code GRATEFUL at checkout. And as always, keep an eye on twitter and instagram for the most up-to-date info! The last days of summer might be one of my favorite times of the year. The weather is still wonderful and everyone is gearing up for the excitement of a new school year. There is a simultaneous calm and energy in the air. For me, personally, all of the busy-ness of San Diego Comic Con and D23 are over, and there are still a few short months until the crazy that is The Holidays sets in. I was born during these dog days, got married on one of these dog days, and generally just feel best right about now. I'm getting ready to head back to the East Coast to celebrate my little sister's wedding (!) and for a short but much-needed vacation with my guy. It seems like I'm always teasing things on my plate, but goodness - fully loaded, multiple spinning plates is what is happening over here. Some examples include this , this, and maybe most notably this (daily sneak peeks happen on Instagram, folks!) so I promise I'm not leading you all on. So while I don't have much new work to share, I wanted to pass along some of my late-summer joy. From now through Sunday enjoy 10% off of all items in my etsy shop including the new items from SDCC that have just been listed! Just use the code SUMMERSALE at checkout. Enjoy these last long days, friends! I will check back in soon!